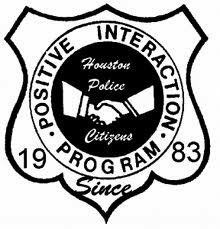 Page Williams represents Ashford Hollow at the Houston Police Department’s Positive Interaction Program (PIP). PIP is a unique crime prevention tool that allows civic associations to send a representative to a monthly meeting for their district (in our case, West Side Command, District 20) to share concerns, ask questions, and watch an educational presentation. Detailed crime reports for the previous month are distributed, and any notable trends explained by an HPD officer. Presenters comprised Finance, Public Works, ReBuild Houston (www.rebuildhouston.org), Water and Wastewater, Parks and Recreation, PlanHouston (www.PlanHouston.org) and Cultural Affairs. There were also presentations by various districts, including the Westchase District, by Irma Sanchez. I had never attended a C.I.P. meeting before, and I found it to be very interesting. Both ReBuild Houston and PlanHouston invite the public to explore their websites and leave some feedback. Citizens were invited to the microphone to ask questions at the end. The Department of Public Works announced a new initiative to work more closely with the public, and have special meetings for major construction projects during the planning stages of those projects. Public Works has now set up an interactive map where citizens can see what C.I.P. projects - completed, under construction, or future - are affecting their neighborhoods. Enter www.pwecip.houstontx.gov into your browser. A window will appear with an optional tutorial. When you click on "close", the map will appear and you can move the cursor to your neighborhood and chose your area of interest. FYI, there is nothing major in Ashford Hollow's future: There is a Memorial drainage project planned from Kimberly to Perthshire, and a Dairy Ashford paving and drainage project from Buffalo Bayou to I-10..